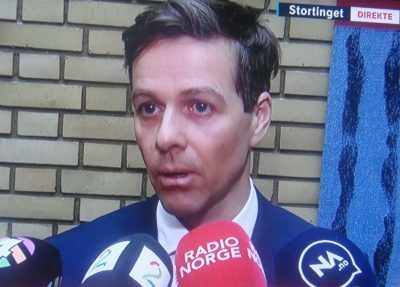 Knut Arild Hareide stressed the need for accountability over blame in explaining why his Christian Democrats party all but forced the president of Norway’s Parliament to resign on Thursday. Hareide’s small centrist party has also been sagging at the polls, though, and may benefit from helping to bring a major political drama to an end. That placed them on the same side as all the opposition parties in Parliament that already had expressed a lack of confidence in Thommessen, and gave them the majority vote. Thommessen had little choice but to finally agree to resign, allow Members of Parliament to elect a new president and, hopefully, restore credibility for the national assembly as a whole. Serious concerns had been expressed lately by both MPs, labour and business leaders in Norway that the drama and budget overruns at the Parliament were undermining the institution itself. Under Thommessen’s leadership, the Parliament “has chosen expensive solutions the whole time,” industrialist Jens Ulltveit-Moe, a former head of Norway’s national employers’ organization NHO, told newspaper Aftenposten Thursday morning. “In both real and formal terms, the Parliament (Stortinget) tops the power pyramid in Norway,” Ulltveit-Moe said. 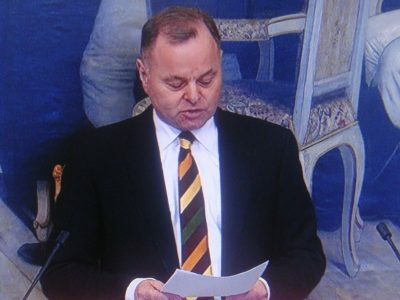 “It’s vitally important for democracy in Norway, at a time when democracy is under threat many places.” The Parliament’s building scandal and its huge budget overruns, he said, indicated that those in charge at the Parliament didn’t set priorities. In some ways, he added, it may seen “unfair” that Thommessen has to take the fall, “but I think that in such a serious situation, it’s important and correct to set an example.” Thommessen, he believed, had to go. With Thommessen refusing to quit as long as he felt he had support, and his Conservatives’ prime minister, Erna Solberg, refusing to ask him to resign, it ultimately was up to the Christian Democrats to seal his fate. It was a difficult decision for them and for Hareide, who has long supported Solberg. He stressed the difference between demanding responsibility and placing blame, noting that Thommessen “was not alone” in making decisions along the way that resulted in the construction project costing at least NOK 2.3 billion instead of NOK 70 million when it started. As president of the Parliament formally in charge of the ill-fated project, the Christian Democrats reasoned, Thommessen had more responsibility and thus needed to be held accountable. The Christian Democrats’ decision came just a day after the party logged its worst showing ever in public opinion polls, with only 3.2 percent of the vote in polls conducted by both Norwegian Broadcasting (NRK) and TV2. The party desperately needs an injection of confidence itself: Acting on, instead of waffling over, concerns about the president of the Parliament may boost its fortunes. Speculation was already swirling over who would replace Thommessen in the position that formally ranks as second only to the monarch in Norway. He or she will likely come from the prime minister’s party, the Conservatives, since it’s up to them to nominate one. Firm candidates aren’t expected to emerge until after the Conservatives’ parliamentary delegation meets next Wednesday.